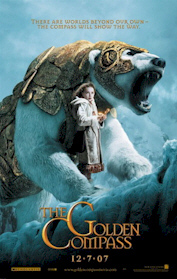 Entertainment & Arts > “The Golden Compass” Movie Has Christians & Atheists Upset – But Why? “The Golden Compass” Movie Has Christians & Atheists Upset – But Why? New Line Cinema’s “The Golden Compass” hasn’t even hit theaters yet and it already has some Christians and atheists upset up in arms, reports USA Today. Apparently the movie, based on the first book of British author Philip Pullman’s trilogy, “His Dark Materials,” has many atheist themes throughout. One concern is that unsuspecting Christian parents will take their kids to the film, buy the trilogy, and unknowingly introduce their children to the wonders of atheism and the damnation of Catholicism. On the atheist side, many are concerned that the film has been “watered down” and is not anti-God, anti-Church enough. I’ll reserve my opinion until after I have seen the film. Yes I do plan to see it. I figure if my faith as well as many other Christians is strong enough to tolerate living in this ungodly world, then I think many can handle seeing this movie. It may even create opportunities for conversation regarding the truth with those who are seeking. Some might argue that it is another tool to promote the world’s anti-God agenda. Well, isn’t most entertainment today geared that way? Besides, in the same manner that we as Christians have th right to celebrate films such as “The Passion of the Christ, “C.S. Lewis’s “The Lion, The Witch and the Wardrobe,” and other films with Christian truths and themes, so do people who don’t believe in God have the right to celebrate films that may promote ant-God agendas. We who are Christians know the truth. And besides that, God’s own agenda for saving the elect is not going to be thwarted by a Hollywood movie. He is much bigger than that. What people should really do is to wait till the movie comes out and either go see it, or read other’s reviews of it and then form their own opinions of it. That’s what I’m going to do.